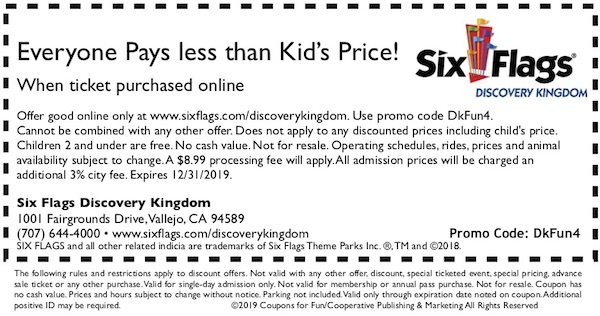 Six Flags Discovery Kingdom in Vallejo, California - get savings coupon! Six Flags Discovery Kingdom is the only combined Oceanarium, Theme Park and Zoo in the world, offering fun and interactive activities, including 35 rides that range from the best roller coasters in Northern California, to the most family-friendly rides, sensational shows, more than 35 interactive and educational animal attractions, delicious dining options, games of skill and the opportunity to meet the loveable Looney Tunes characters. No need to take coupon to Six Flags Discovery Kingdom after you’ve purchased ticket online.